Paradigm MilleniaOne/Seismic 110 review | What Hi-Fi? 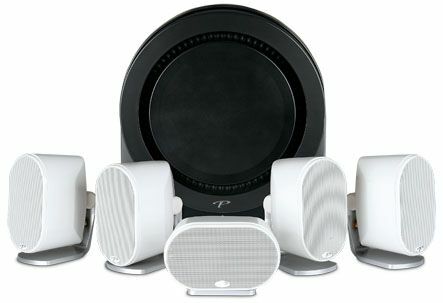 If you’re looking to set up a decent home theatre system, and your budget stretches to £2500, it’s worth considering this MilleniaOne/Seismic110 5.1 surround speaker package from Canadian loudspeaker manufacturer Paradigm. The MilleniaOne 5.0 package is part of Paradigm’s high-end Reference series. All five MilleniaOne satellites are identical, which goes a long way to maintaining seamless integration across the speakers, so surround sound is cohesive and organised. We’d remove the magnetically attached grilles: the speakers look rather good, and sound a bit more open without them. Inside, a 25mm satin-anodized aluminium dome tweeter sits above a matching 10cm mid/bass driver, and they’re housed in a compact and sturdily built die-cast aluminium case that’s finished in either gloss white or black. The package is completed by the Seismic 110 subwoofer, with its forward-firing 25cm driver powered by a Class D amplifier with a claimed output of an impressive 850W. It’s also sold separately, at £1250. The sub can produce lashings of power, but it's one of the more compact designs we've seen. Its curved cabinet is an unusual but stylish alternative in a world of square and boxy monoliths, and comes in a single finish of satin black. Like the MilleniaOne satellites the sub is mighty solid, and its drive unit features a heavy-duty triple magnet motor system, a large voice coil, and an inverted surround to ensure minimal distortion with consistent extension. Play the Blu-ray of Hugo and the package complements the DTS-HD Master Audio soundtrack with delicate dynamism and confidence. The steering of surround effects is seamless, even if the system could benefit from a touch more openness. You can clearly hear the steam train leaving the Paris station with plumes of billowing smoke, and chugging away into the distance – a sound trail that travels with detail and assertion from front to rear. The satellites deliver plenty of subtle detail with a great deal of weight. The steampunk-tinged film is full of clockwork mechanisms, and you can hear the gears and cogs turning and working together with a satisfyingly solid sound. Dialogue is clean and direct, with voices packed with subtlety and character – it’s a trait that works well with stereo music as well. The rhythmic and dynamic changes are gradual and smooth, reaching clear highs that never strain. While overall the Paradigm package is very easy to listen to and enjoy, it can sound a bit too relaxed at some points. Switch to the action-packed X-Men: First Class, and you’ll find that while there’s a good amount of enthusiasm, the package doesn’t manage to muster up the muscular and dramatic punch on the scenes that need it. A lot of this comes down to the subwoofer. The Seismic 110 is capable of going very deep indeed (down to a claimed 18Hz) and has a claimed peak output of 1700W. However, it faces stiff competition against the similarly priced and formidable B&W PV1D (£1200). In comparison, the Seismic 110 isn’t quite as agile or taut, and it’s this aspect that can take away some excitement from climactic action scenes. This package is a smooth and easy listen, with an attention to detail to marvel at. With just a bit more punch, especially in the sub, it could have grabbed that elusive fifth star.